Inspired by historical images of violence, both Travis Somerville and Ken Gonzales-Day’s installations focus on the mechanisms surrounding violence rather than the victims, requiring viewers to ascertain what is missing. Somerville’s Crowd Source is based on a photograph of the 1930 lynching of Thomas Shipp and Abraham Smith, two African-American teenagers. Far from a simple meditation on past oppression, the work suggests the persistence of racial injustice in the 21st century: Crowd Source is a contemporary term for gathering wisdom, insight, or support from large groups of people—often via the internet. 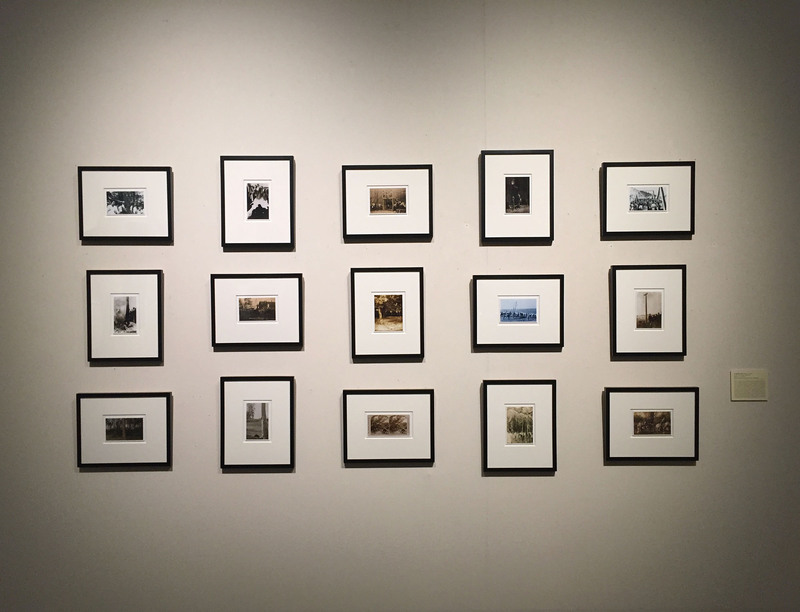 Gonzales-Day derived his Erased Lynching series from found lynching postcards and archival source material of Mexican, Native American, and Asian lynching victims in California from 1850-1935. Gonzales-Day digitally removed the victims from the historical postcards, and Somerville drew only the faces of the onlookers; in both works the absence of the body illustrates the erasure of these events from public memory. Both Somerville and Gonzales-Day shift the gaze from the corpse to the mechanisms of lynching itself: the mob, the tree, the spectacle of the event, and the role of flash photography in memorializing a tragic moment and perpetuating myths about “frontier justice” in American history. Using retro-reflective screen printing technology, Hank Willis Thomas obscures archival press photographs of public events that resolve only through flash photography. To the naked eye, the images appear as white-washed scenes devoid of any perceptible narrative; through the augmented gaze of the camera’s lens and flash, the images document instances of racial and social injustice. With All Deliberate Speed both obscures and reveals the Pulitzer-Prize winning, 1976 photograph of a white man assaulting a black civil rights lawyer with a pole bearing the American flag. In transforming the use of a cell phone camera from an option into a necessity in order to view his work, Thomas gives contemporary viewers a choice: to see and engage with history, or to avoid it.